The main aim is to present the concept of the Sustainable Development from the European and Global Perspective. Sustainable development has long been one of the overarching objectives of EU strategy and policy. EU leaders launched the first EU sustainable development strategy in 2001 and updated it in 2006 to tackle shortcomings and take account of new challenges. The EU has some of the highest environment standards in the world, developed over decades to address a wide range of issues. European Commission proposed recently the new economic strategy for Europe “Europe 2020”, including three key drivers for growth (smart, sustainable and inclusive growth), to be implemented through concrete actions at EU and national levels. New sources of growth will have to be supported by investments in infrastructure, innovation and education to facilitate productivity growth, while ensuring sustainable use of resources in a greener economy, within a context of open markets. Sustainable development must be taken up by society at large as a principle guiding the many choices each citizen makes every day, as well as the big political and economic decisions that have. This requires profound changes in thinking, in economic and social structures and in consumption and production patterns. 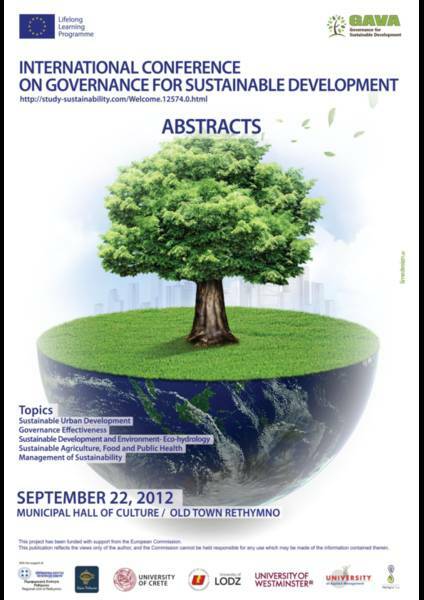 Key sustainable development challenges on the global level of international organizations (WTO, UNEP, UNCTAD, etc.) concentrate mainly on: climate change and clean energy, sustainable consumption and production, conservation and management of natural resources, sustainable agriculture, public health, social inclusion, demography and migration, fight against global poverty, education and training, research and development, financing and economic instruments and fight against corruption. This presentation’s main aim is to challenge the traditional assumption that the crisis creates a favorable environment for reforms. On the contrary, the current economic crisis in the Eurozone makes the reform attempts more difficult. The argument will be supported by an analysis of the Greek Memoranda of Understanding. The actions included into them suffer from the lack of a strategic vision and an implementation methodology. The MoUs are mono-dimensionally financial, i.e. they are diminished into numbers which must serve the financial target. The collapse of the political system along with a values’ crisis compose a negative context for solving the multiple problems of the Greek public administration. The reform agenda has no owner for the moment: Tackling overregulation, red tape, lack of coordination and control, absence of evidence in the policy making process as well as ensuring a strategy for empowering the human potential, rationalize the structures and connect the budgetary process to targets and results, are still some of the non-adopted reform agenda items. To that end, the failure to activate the civil society leads to the demolition of the state – not its reform. The “Governance for Sustainable Development” (GAVA) curriculum has been developed as a part of the Lifelong Learning Program, Erasmus Subprogram, call for proposals DG EAC/41/09 – Action: Multilateral Projects – Sub–Action: Erasmus European Modules. The common syllabus has been developed by a consortium of five Institutions of Higher Education with considerable experience in the teaching of interdisciplinary curricula oriented towards the needs of modern governance for sustainable development in Europe and beyond, especially in developing and transitional economies. The Program is the result of the cooperation between the University of Lodz (UoL) in Poland, the University of Westminster (UoW) in the United Kingdom, the University of Applied Management (UAM) in Germany, the University of Crete (UoC) in Greece, and the Graduate Institute for food, animal health, agricultural and environmental sciences VetAgro Sup in France. In an effort to tackle global challenges, the GAVA consortium members feel that the best way to proceed is to develop a strategy that comprehensively addresses long–term issues and is capable of leading the economy of each and every country to stable, balanced, and sustainable growth. Achieving economic and social stability as a global public good requires better governance. This is especially true in developing and transition economies. In order to develop such a strategy we need a shared set of minimal but key principles and standards on propriety, integrity, and transparency governing the conduct of international business and finance. In addition, new sources of growth must be indentified and supported by investments in infrastructure, innovation, and education. In line with the Bologna Process recommendations, teaching will be based on interdisciplinary studies that take into consideration selected aspects of law and public administration, the social sciences, public health policy, environmental studies, and certain geography–related issues. 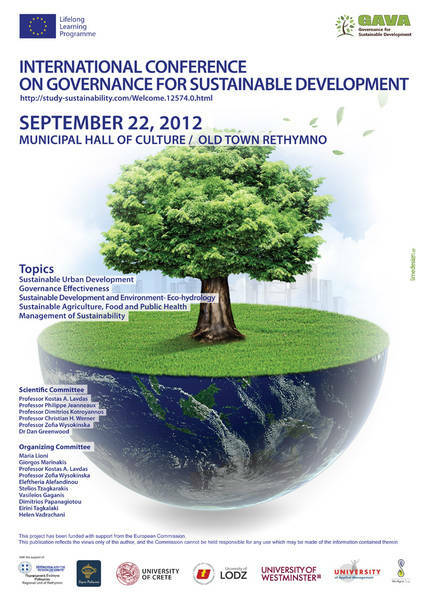 Hence, participants will have the opportunity to acquire advanced knowledge in the economics, politics, law, and administration of sustainable development; they will be able to focus on problems and challenges of micro– and macro–economic management, with special emphasis on processes and problems relevant to environmental protection and implementation of the principles of sustainable development. The courses aim to encourage knowledge that is useful to practitioners and public administration officials on all management levels, managers and future business owners, specialists in the economics of environmental protection and management, administrative law, and those seeking specialized knowledge in eco–hydrology and sustainable agriculture, all depending on selected specialty offered within the framework of the study program. The study program spans four semesters and is concluded with the awarding of a Master’s degree. Last but not least, all GAVA members also acknowledge the need for higher education institutions to play an active role in the creation of a sustainable development culture, hence they afford their participating students and professionals the opportunity to familiarise themselves with good governance concepts and ideas that will enable the bringing about of the much needed changes. The University of Lodz (UoL), Poland. 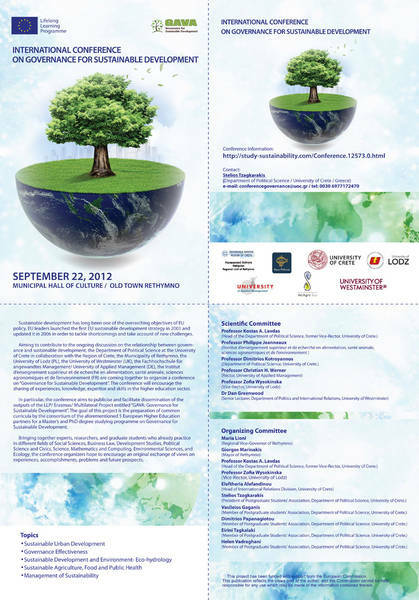 “Sustainable Development and Environment – Eco-hydrology” will be realised by the University of Lodz (UL) by the Faculty of Biology and Environmental Protection at the Department of Applied Ecology with a strong cooperation of the European Regional Centre for Ecohydrology under the auspices of UNESCO (ERCE), PAS, in Lodz. As an interdisciplinary field the implicit goal of which is to achieve sustainability Eco-hydrology integrates not only hydrology and ecology but also considers geophysics, geology, molecular biology, genetics, mathematical modelling with socio-economical (e.g. foresight) and legal aspects. Specialization includes 6 elective courses: Applied Ecohydrology, Environmental Modelling and Statistics, Environmental Landscape Planning, Ecotoxicology, Watershed Pollution Control, Foreign Language. There also exists an additional elective course, Urban Ecohydrology. The University of Westminster (UoW), United Kingdom. The University of Westminster will responsible for carrying out the specialisation: “Sustainable Urban Development” of the GAVA Master’s Level Programme. This specialisation is designed for students wishing to develop both their conceptual understanding and practical knowledge of urban development and planning and the inter-relationships with issues of environmental, social and economic sustainability. A range of challenges in sustainable urban development are explored, through a variety of case studies and practical examples viewed from local, regional and global perspectives. This specialisation pathway consists of one core module Sustainable Urban Development: Governance Challenges and a choice of two from four elective modules: Housing and Regeneration Public Participation and Engaging Communities, Planning for Urban Risk and Resilience, Public Realm: significance, design, experience. The University of Applied Management (UAM), Germany. The University of Applied Management will offer the specialisation course “Management of Sustainability”, which consists of six modules: “German Language”, “Markets and Business Models of Sustainable and Environmental Management”, “Changing Consumer Behaviour: Theoretical Concepts and Managerial Implications”, “Organizational Behaviour and Change Management”, “Resource Management and Sustainability”, “Sustainable Innovation”. The University of Crete (UoC), Greece. The specialization entitled “Governance Effectiveness” tackles issues which concern the quality of public services, quality of the civil service and the degree of its independence from political pressures, the importance of common pool resources and the role of government, links and interactions between state institutions and human, social and environmental rights, Europeanisation and the policy effects of European unification and, finally, governance and sustainable development in Southern and Southeastern Europe. The University of Crete will be bringing in its expertise on EU policies, management sciences and health governance in relation to sustainable development with the provision of four of electives: Sustainable Development in the EU-The Challenge of Implementation, Corporate Responsibility, Health Governance in countries under the financial crisis, and Public e-Health and evidence-based. Finally, there will be a Greek language course which aims at helping students, first, to obtain writing, reading and basic everyday life communicative skills in Greek, and, second, to equip participants with the necessary knowledge in order to develop an advanced conversation on specialized scientific topics of their interests. The newly established VetAgro Sup Institute proposes a high quality program in its main fields, “Agriculture-Food-Public Health”, which has an important place in the international governance for sustainable development. The VetAgro Sup program enables students to have an advanced understanding of these global issues, mainly at the European scale. The programme comprises of 5 modules to include Fair trade and local food processing, Organic Farming, Ethics and sustainable development, International governance: Food and sanitary safety/ Food and health risk management, Grassland multifunctionality, whereas there is also an additional cultural module which is the French language. Even though green brand image enjoys increasing academic attention, the concept of green country image has been relatively neglected in marketing and advertising research. Our theoretical overview aims at addressing this gap. Based on a systematic review of existing image conceptualizations across different entities (e.g., brands, celebrities, organizations) we provide a first definition of green country image and differentiate this dimension from other image facets. Exemplary applications of green country image within different fields of marketing research (e.g., tourism marketing, country of origin effects) illustrate the predictive relevance of this construct. Sustainable development (SD) consists of a continuous fundamental and overarching objective of the European Union (EU). The current financial crisis poses a threat to SD since limited resources are available to promote growth and wellness and the health domain is being highly affected. In particular, the health inequalities, medical costs and even essential needs associated with the treatment of poor populations would serve as a serious obstacle for SD. This contribution will review the relationship between health and SD, aiming to discuss the key health related development issues. The recent WHO statement that followed the United Nations Conference on SD (R10+20) would be shortly presented. Tools and guides to health gain and particularly those from Structural Fund programs that can assist regions to plan, monitor and evaluate projects for SD would be discussed. Lastly, empirical experience gained from health related projects designed and implemented by the University of Crete would be shortly presented. Since the Second World War, humanity has known two main agricultural revolutions which can be qualified as two successes: the agricultural revolution in developed countries and the green revolution in developing countries. Worldwide cereals production reached 2.400 million tons in 2010 vs. 950 million tons in 1961 thanks to increased productivity, increased farmland, specialization, irrigation, technical innovation, mechanization… But, if western countries are now food self-sufficient, FAO in 2011 estimated a little less than one billion undernourished, virtually all in developing countries. Agricultural revolution is also responsible for the increasing soil erosion, biodiversity loss, and groundwater contamination. Simultaneously, economic conditions for farmers are becoming more stressful and the number of family farms has decreased. For the next decades, agriculture will be faced with major economic, social and environmental challenges: food safety and quality, climate change, biofuel development, soil protection, biodiversity preservation, water conservation, contributing to renewable energy, remained balanced territorial development, poverty reduction, land speculation… Now we need a sustainable agriculture to make human activities compatible with the demands of the earth's eco-system. Sustainable Agriculture is a paradigm based on human goals and on understanding the long-term impact of our activities on future generations, on environment and on other species. Sustainable agriculture needs policies, innovation, research and education program, and GAVA project is a relevant way to implement this challenge. 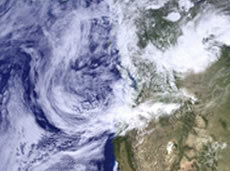 Since the late 1990s the term sustainability has developed from the periphery to a central focus of many business, organizational, and political strategies. Thus, throughout the world and across institutions decision makers and managers need to be informed about the concept of sustainability and the implementation of sustainable strategies. Academic institutions of different disciplines in many countries have implemented a broad range of sustainability education programs varying in terms of content, length, target group, and academic qualification. In order to provide educational managers and higher education policy makers with a systematic review of this educational market we present a systematic large-scale analysis of sustainability education programs across the world. Our overview offers important insights into this branch of education and presents recommendations in terms of standardization as well as quality assessment and content. Since the Green Paper in 2001 the European Union (EU) has incorporated within its sustainable development policy framework the concept of Corporate Social Responsibility (CSR). The CSR concept was mainly developed in EU through the implicit way and from the beginning of the 21st century a gradual policy transition took place towards the CSR explicit view, which is based on it’s voluntarily nature and the triple bottom line approach (economic, social and environmental dimensions). Hence, this transition improved significantly the CSR position in the EU public policy agenda for sustainable development. The CSR as a concept contributes significantly to the European business sector’s engagement to sustainable development via public policies towards environmental modernization, innovation, labeling, responsible entrepreneurship and investments. Furthermore, since 2006 the EU have set the goal of international pole of excellence on CSR by promoting sustainable development to European business sector and by 2007 have focused extensively on the Small and Medium sized Enterprises (SMEs). The SMEs are the backbone of EU development sectors (almost the 98%), they contribute significantly to the EU production line and they hold a significant position in supply chain. Hence, the SMEs potentials and obstacles towards sustainable development are significant and they are pictured further in the CSR Strategy 2011-2014. The structural deficiencies of the public sector in Greece were one of the major impediments to achieving high rates of economic and social development. There was a need to restructure local government in functional scale. The first tier level of government is constituted by the municipalities, which have resulted from merging several former municipalities and communities. They are strengthened with new powers particularly from the abolished Prefectures, in education, welfare, health, employment, issuing building permits and planning applications localized, spatially regulated. For the delineation of administrative boundaries of new municipalities rational and objective criteria are adopted that leave no room for interferences. Transparency is promoted and attempts are made to improve the environment for business activities by creating new institutions and the use of internet and new technologies "Kallikratis" in practice means transparency, accountability, functionality, efficiency and better services for the citizen, promotion of democratization and encouragement of the participation of local communities in decisions affecting them. Corporate Social Responsibility (CSR hereafter), “a concept whereby companies integrate social and environmental concerns in their business operations and in their interaction with their stakeholders on voluntary basis” (European Commission, 2001), receives increasing publicity. This project investigates the impact of alternative certifying institutions on firms’ incentives to engage in costly CSR activities as well as their relative market and societal implications. Firms’ profits are the highest under private certification; they are the lowest under the NGO, while they lie in between under the public certifier. Consumers’ surplus is the highest under the NGO; it is the lowest under private certification, while it lies in between under the public certifier. Total welfare is the highest under the public certifier; it is the lowest under private certification, while it lies in between under the NGO. If all three certifying institutions are active, firms will opt for the private certifier, if the certification market is competitive. In contrast, if it is monopolistic, firms will opt for the public certifier. Regarding the governance and regulation of firms’ CSR activities, the findings point out: First, the need for policy measures to encourage firms’ CSR activities and their certification. Second, the need for regulating the relevant certification market so as to attain the maximum consumers’ surplus and total welfare possible. Public – Private Partnerships appears as a major pillar of State reorganization in Greece and the development of a new governance model for the provision of public goods. Despite its political legitimacy, public acceptance and (re) - regulation, initiative faces major problems regarding its implementation and incorporation from local government agencies. Structural limitations and administrative burdens, affect negative policy’s effectiveness and the emergence of a new governance model, in terms of service provision alternatives and local state organization. Effectiveness and diffusion which appears limited at a horizontal – national level, under the pressure from centralistic regulation, social capital characteristics and national local governance tradition. By same time, various emerging good practices of public – private partnering appeared in Greek local government, but at a level of alternative regulation and innovate participatory governance arrangements, beyond the legitimated national regulatory framework and central government’s policy. Based on qualitative and quantitative empirical data, article analyzed the effectiveness and the impact of public – private partnerships and their contribution as the catalyst for the transformation of current local government regulation mode in Greece. Under which conditions alternative institutional model could achieve the governance & effectiveness goals and harmonized with citizen needs and expectations. The viability and the prospects of public – private partnerships and new Governance in Greek local government will be additionally evaluated regarding of the National Culture effects and its determinants at social capital level. Recent years are said to have witnessed a “transformation” in policy and politics from top-down hierarchical government to partnership and network-based governance. In economics, geography, sociology and politics – and across policy areas – researchers have shifted their attention to the processes and actors that reside outside the narrow realm of traditional parliamentary and policy institutions. This paper examines some of the key arguments put forward by governance theorists. It situates the turn to networked governance in the UK amidst frustrations with policy implementation problems and the increasing social alienation of the 1980s. In this sense, the grid of networked governance – entailing interactions between public managers, private actors and citizens alike – promised more effective and legitimate policy. The paper then proceeds to examine some of the challenges that come with governance. It identifies a pressing research agenda: to critically engage with networked governance in order to ensure the public interest is served. It also points out that government continues to provide crucial accountability mechanisms. Finally, the paper concludes by questioning the extent of the transformation and argues that the age-old debate on how best to coordinate or “steer” social and economic affairs is one that is very much alive. Sustainable development arise concern for the potency of natural systems along with the social challenges faced by humanity including the social perspective. The three pillars of sustainable development are the socio-cultural, the economic and the environmental and they are interconnected. This paper will examine the role of social pillar in cluster of sustainable development. Particularly, social rights aim at the establishment of social equity and security. There are part of Human Rights arising from the social contract and their major development considered after the Second World War. The social rights that will be examined in this paper are Employment, Education and Health Care. As the sustainable development pillars are interconnected, welfare policies are also, dependent on economic and cultural factors. Social capital’s sustainability can be provided through welfare policies. Their role is to sustain the security, equity and viability of the society by providing benefits to all citizens but most importantly to the vulnerable. The purpose of this paper is firstly to examine the importance of social rights in order to achieve sustainable development and secondly, the political paths which lead to the implementation of this goal. The promise of the ‘sustainable city’ has long been attractive, both in the global South, as a potentially constructive solution to problematic forms of urbanisation, and in the North as an imaginative transformational direction for cities in the post-industrial age. Should we welcome the ‘mainstreaming’ of urban sustainability into policy making? Or be concerned that earlier socially radical models of urban sustainability have been usurped by ones “organized within the horizons of a capitalist order that is beyond dispute” (Swyngedouw, 2010)? In the wake of recent economic turmoils, will policies increasingly prioritise the need for competitiveness (Flint and Raco, 2012)? Or might the crisis facilitate the discovery of alternative approaches?